The world around us is changing every second in this digital era we live in. The software of our personal computers, smartphones and all the E – gadgets are getting updated timely; and it’s inevitable too. It seems that the Indian politics is the only thing that continues to move along the same traditional patterns without getting updated. In this context, a question was asked to Rahul Gandhi by this writer at the GOPIO (Global Organization of People of Indian Origin) conference, during his first foreign visit to Bahrain after being elected as the ‘President’ of All India Congress Committee (AICC). The ease with which Rahul Gandhi answered the questions surprised the audience during his interaction with them. Rahul, who comprehended the essence of my question which also dealt with Indian politics and Congress, was quick with his reply. While Rahul Gandhi was replying in a clear voice filled with willpower, Satyanarayan Gangaram Pitroda, widely known as Sam Pitroda, the man behind the developments in Indian Telecommunications and IT was on stage along with him. The presence of Sam Pitroda, who was the technical advisor to Rajiv Gandhi, could only be seen as a co-incidence in the historical turn of events. It was visible that Pitroda, the Chairman of India’s National Innovation Council was also enjoying the reply given by Rahul. These words of Rahul Gandhi were approving the fact that various activities that are to bring stark changes in the organization’s functioning pattern and the party structure have already been started within Congress. On 2015 November, while interacting with the students of Mount Carmel College, Banglauru, Rahul Gandhi had talked about remoulding the Party and giving a new face to it. We could hope that the expected plan that promises a new perspective for Congress Party has reached its final stage. 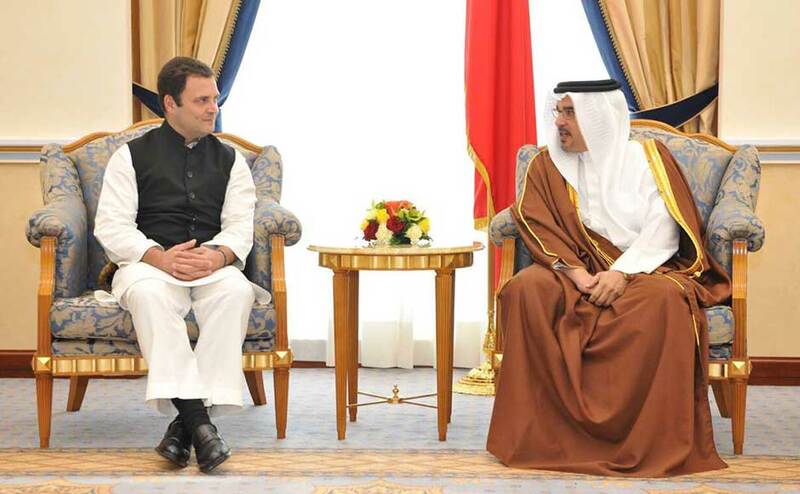 While interacting with the audience in Bahrain, Rahul Gandhi said, “We are not supermen. We also make mistakes. However, we will go ahead rectifying all those mistakes. What we have to do is to present a new Congress party. You will see dramatic change in Congress party .You will be seeing leaders in Congress in which you believe.” This leadership quality of Rahul Gandhi with his honest nature that receives questions with a smile attracts everyone around him. “I came here in Bahrain to meet you all to let you know that you are an integral part of our nation. There are several issues affecting our land now. You make a part of the solution to those problems. I came here to remind you that whether you are here, or anywhere in the world, you, the Indian citizens residing in these foreign lands should build a bridge with the homeland”, Rahul said at the GOPIO meet. Rahul Gandhi’s move to assign Sam Pitroda as the Chairman of Indian Overseas Congress is to strengthen that bond with Congress party which had taught the people of India, born into different castes and religions to live together as equals. This step of Rahul Gandhi should be seen as a part of the Congress reformation process. Sam Pitroda was with Rahul Gandhi when he grabbed the world’s attention through his speech on Gandhian values at Berkeley University, California. It was Pitroda himself who made the Congress leadership realize that time has come to implement new reforms and renovations to the generations-old customs of Congress. In 2004, NDA alliance under the leadership of then Prime Minister Vajpayee contested the elections citing the huge strides and gains in the IT sector and raising the slogan, ‘India Shining’. BJP’s campaign revolved solely on claims that all the successes mentioned were due to the four-year reign of the NDA government, whereas, it is said that the claim was far from truth. Sam Pitroda, the man responsible for the Telecommunication revolution, was very well aware that the credits for the developments that the BJP was trying to steal, rightfully belonged to young visionary Prime Minister Rajiv Gandhi. It was Sam Pitroda, who had laid the seeds, the fruits for which were being claimed now by BJP. Not able to restrain himself, the master technologist himself flew down from the United States to disclose and lay bare, the faulty claims of BJP. Pitroda, who served Rajiv Gandhi for over a decade had left India after his death and gone back to his business in the IT industry. Pitroda organized a series of press meets at the IT hubs of Hyderabad and Bengaluru to reveal the false allegations raised by BJP. BJP, the then opposition who disagreed and opposed many of the initiatives started by Rajiv Gandhi in the IT sector had gone to the extent of insulting the team, calling them “Computer Boys”. The real image of a group which had suddenly worn the attire of champions of all the benefits accrued as a result of visionary initiatives introduced by Rajiv Gandhi was revealed before the public by Pitroda. It was, upon realizing the need to spread the mission started by Rajiv Gandhi to the Indian villages, that Sam Pitroda, known as the ‘Change Agent’ returned to India to involve in the activities as before. He submitted Sonia Gandhi a new rejuvenation plan in 2004 that could inject new energy into the veins of Congress. Today, Sam Pitroda is a member of the team assisting Rahul Gandhi in Congress reformation mission. Although born in Odisha, Pitroda carries a strong relation with Gujarat. His father getting inspired by Gandhian thought sent a young Sam to Gujarat to learn about Mahatma Gandhi. Later, his engineering degree too was completed in Gujarat. Sam maintains cordial relations with the Gujarati community staying abroad. In the recent Gujarat elections, Rahul Gandhi was advised by Sam Pitroda, the technocrat and Gandhian philosopher on all aspects of technology. Rahul Gandhi appreciates and realizes the need for adequate changes to happen in politics in this Technetronic age when technology embraces all walks of life. We cannot deal the obstacles of the current world with old styles and format. New changes should happen in Congress. Congress is now led by a leader who believes that single thoughts and actions should change. Rahul Gandhi likes space for open discussions and team work. He at many times has noted that democracy is not something where one orders and others obey. It is due to this, he engages in debates and discussions with the audience at all major meetings. He firmly believes that one person cannot change everything. What the Indian community all over the world heard through Rahul Gandhi’s words in Bahrain was a call for everyone to join the upcoming change that are to engulf Congress. As part of the mission to connect more non-resident Indians to the Party and to interact with them, Rahul will soon visit countries like Canada, Singapore, and Dubai. In each of his journeys to far away lands, Rahul always behaves like a common man. He reaches out to the public, listens to their worries, and acts as one among them. A leader who stands in the queue at airports and other public places; a leader who walks out of the airport carrying his own luggage and the list goes on. However, when it comes to the matters of the masses, Rahul’s voice gets sharp and stern; expressions flash on his face. It’s not just the Congress, but, the hope of an entire nation rests now on ‘Rahul Gandhi’.